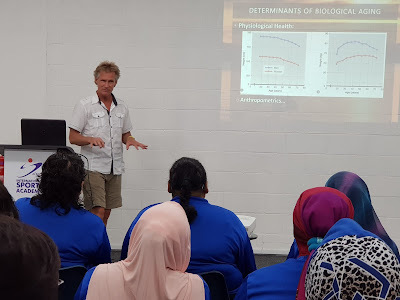 A research initiative driven by Celebrity Dee Dee Mahmood, multi-award winning Exercise Physiologist, Nutritionist & Academic Adjunct Senior Lecturer (International Collaborations) of Edith Cowan University Australia, studying the impact of modified sports on community health, in collaborations with American College of Sports Medicine North-West's Professor Dr Dan Heil of Montana State University, with strong support from our partners in health - International Sports Academy, MHI Training Master, Peacehealth Ambulance, Fitharmonik Online, Norwegian Seafood Council, Mak Ai Nasi Padang, People's Association and Tampines Changkat CC & RC Zone 4 and www.deedeefitness.com. WAKO, Active Red and XLab were on site promoting physical activity too. 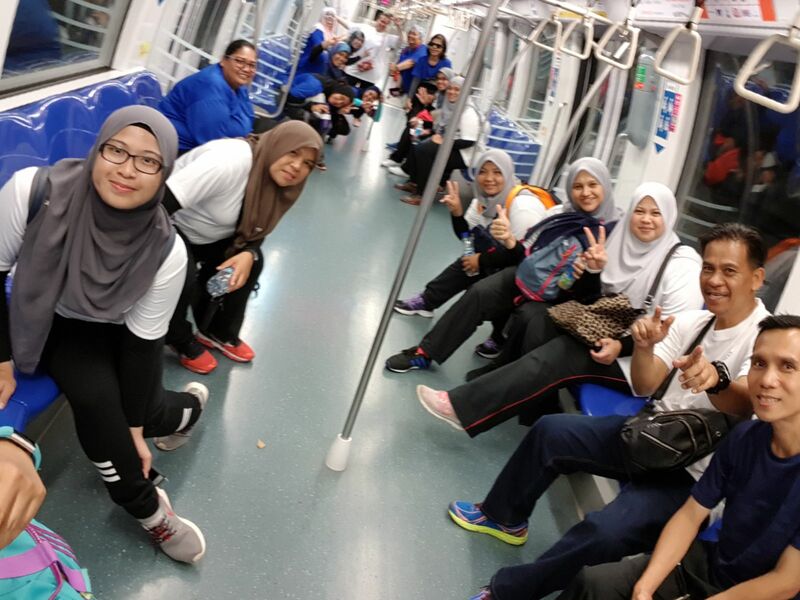 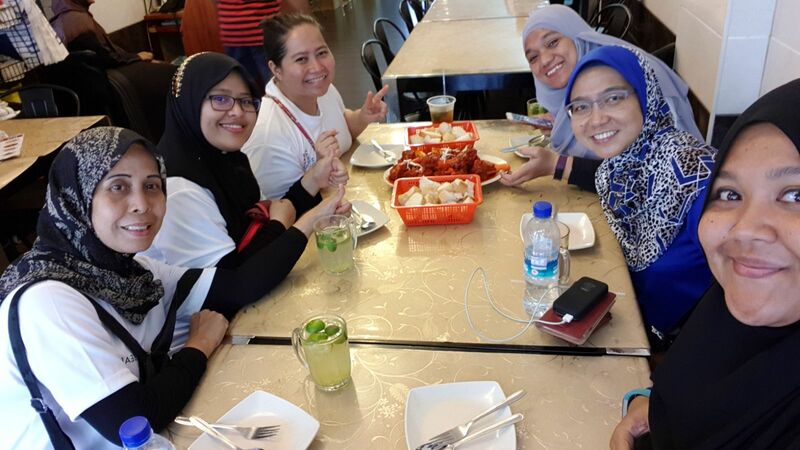 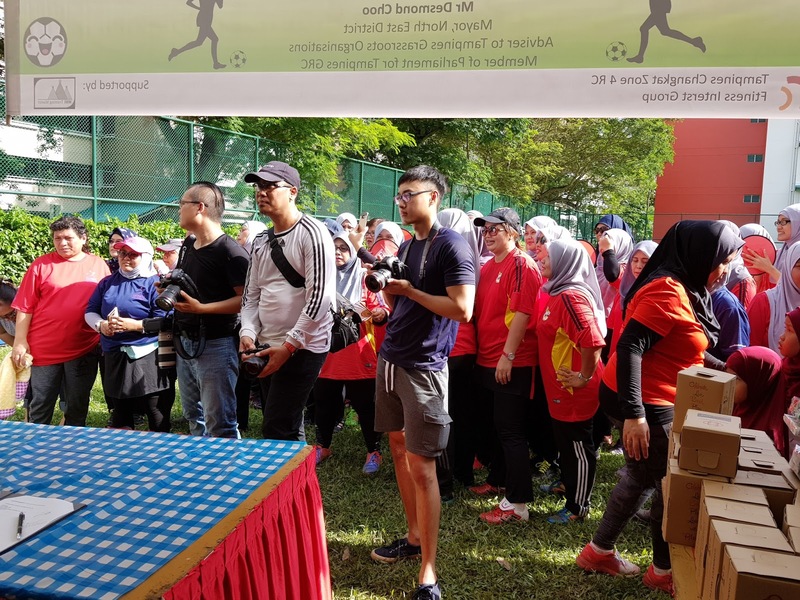 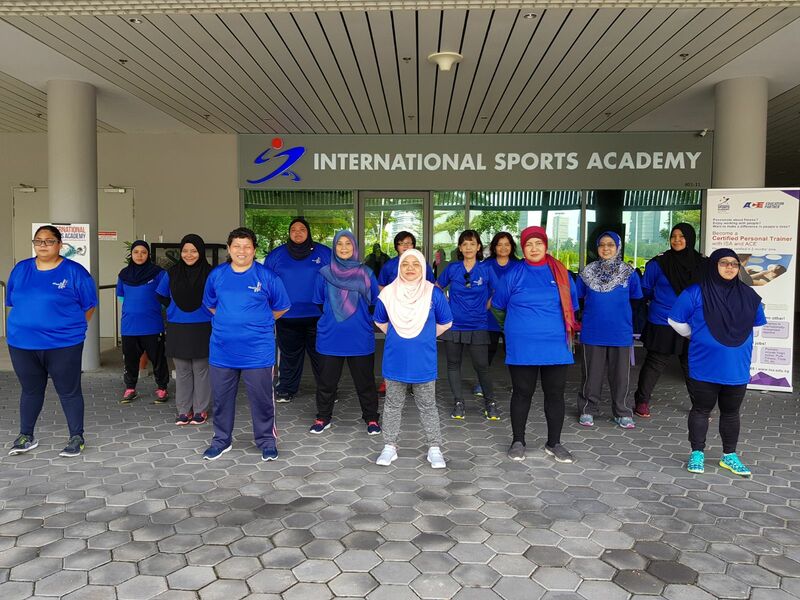 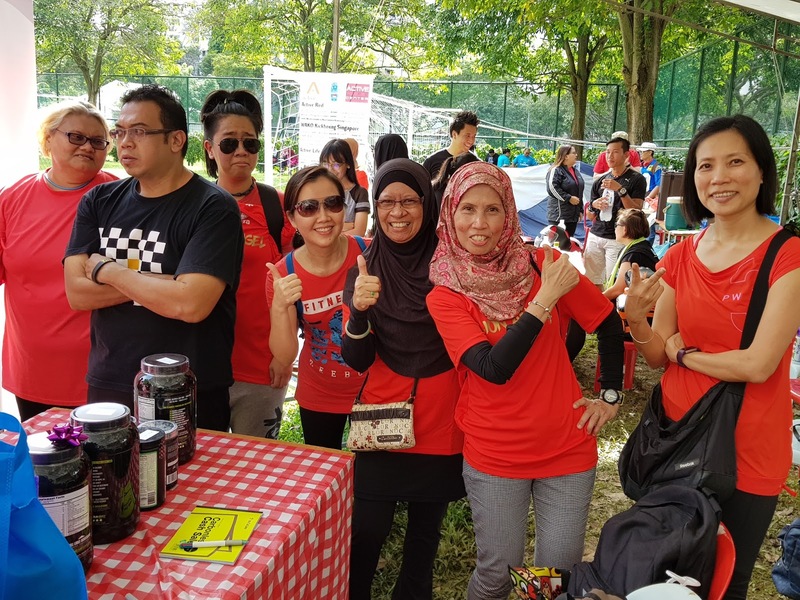 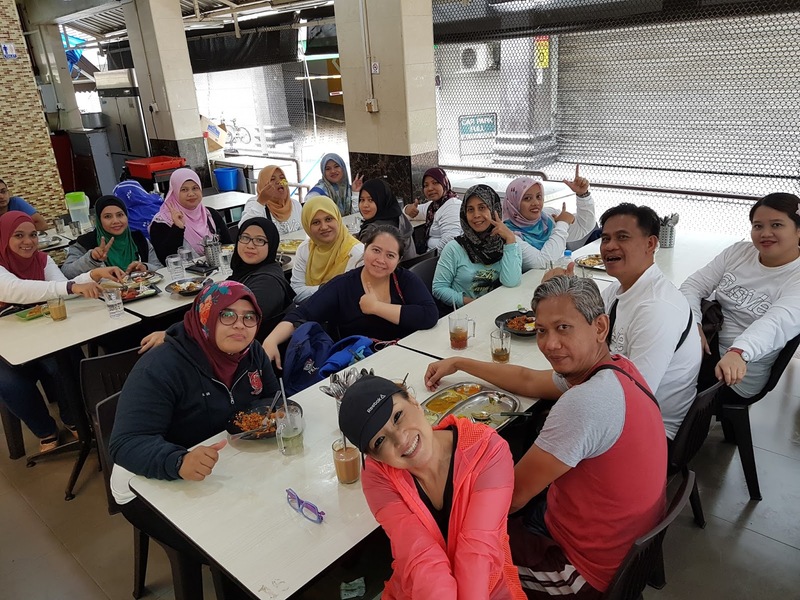 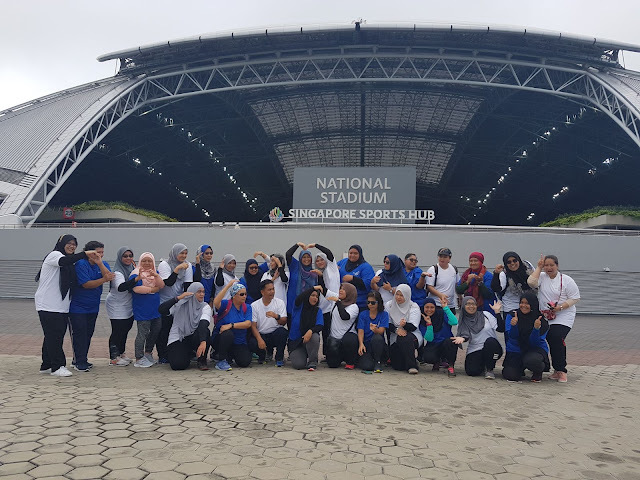 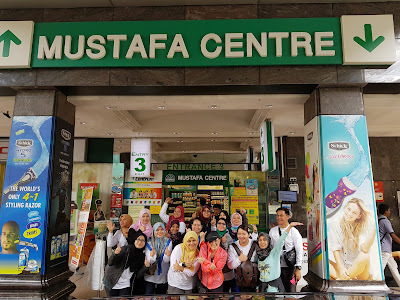 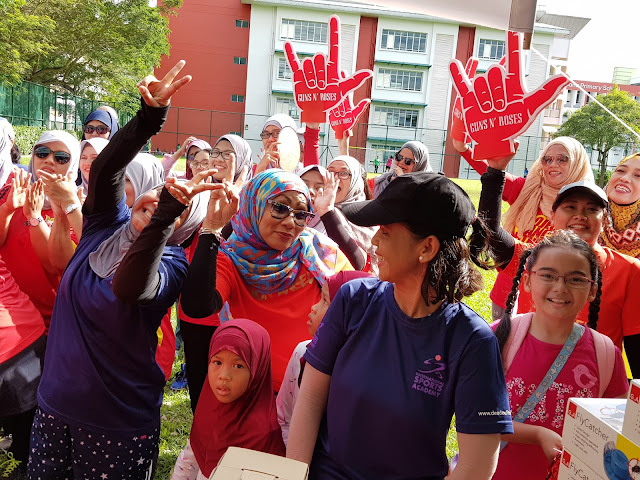 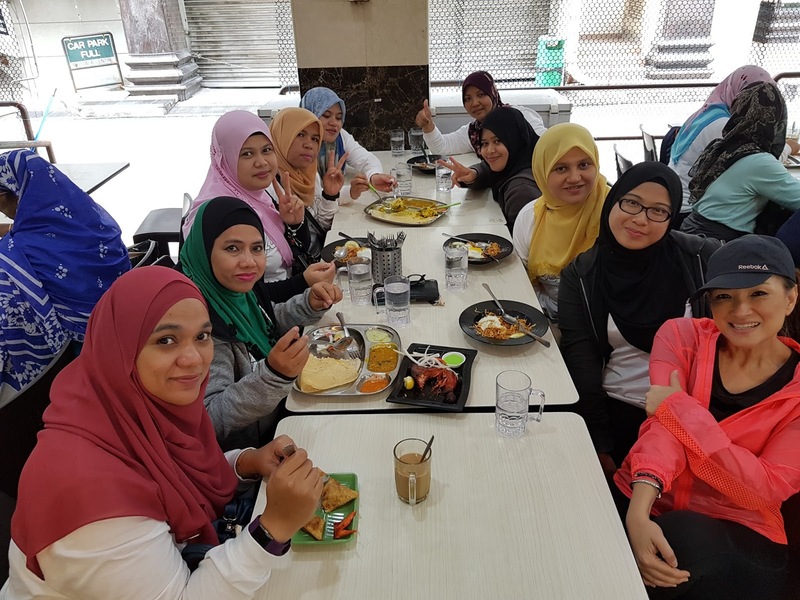 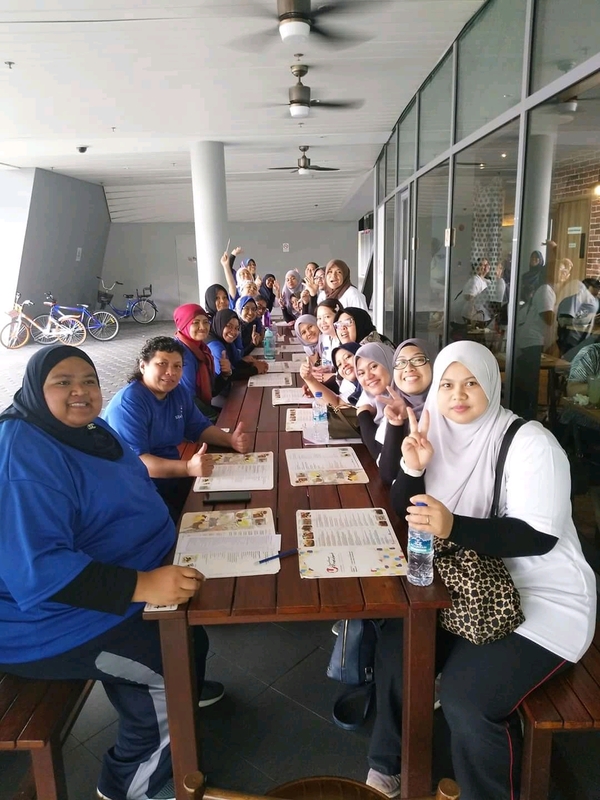 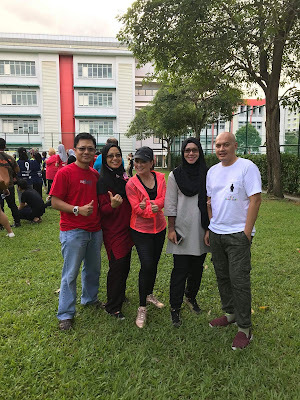 (Rina Moktar, Nurhairati, Suzana Ary, Siti Rohani Jaafar, Sharifah Dayana Sherif, Yatie Mohd and Sapiah Rosdi) and students from International Sports Academy. 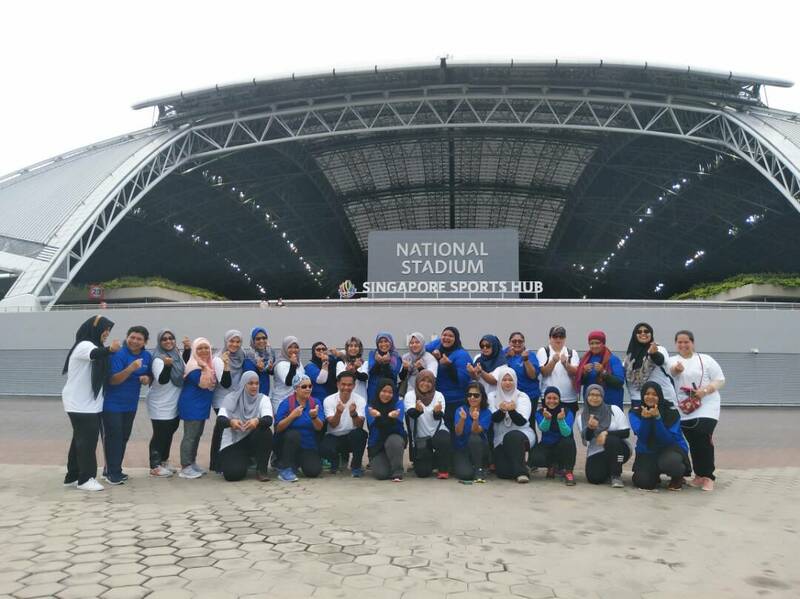 Lion Angels Singapore was divided into 2 teams Lion Angels Extreme and Lion Angels Dynamite. 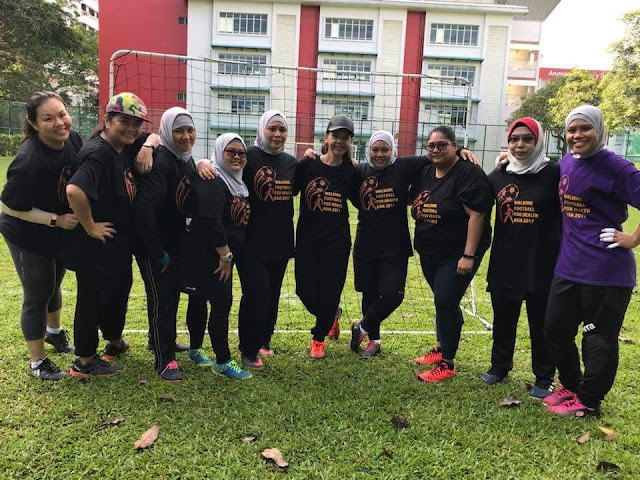 They were up against Tiger D'Warriors team from Malaysia in a round robin league system; whereby each team plays one another once with 3 points for a win, 1 point for a draw and nil for match lost. 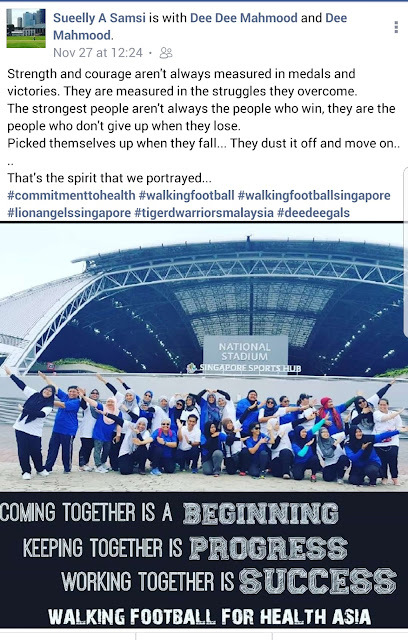 The walking football competition was fierce emotionally, maybe a first for some, but life-changing and character-building for many. 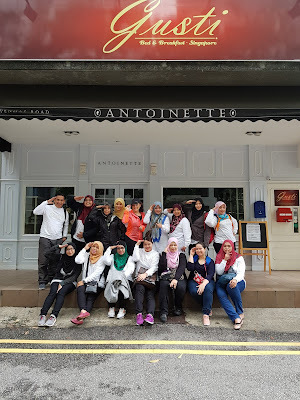 Emotions were running its highs and lows. 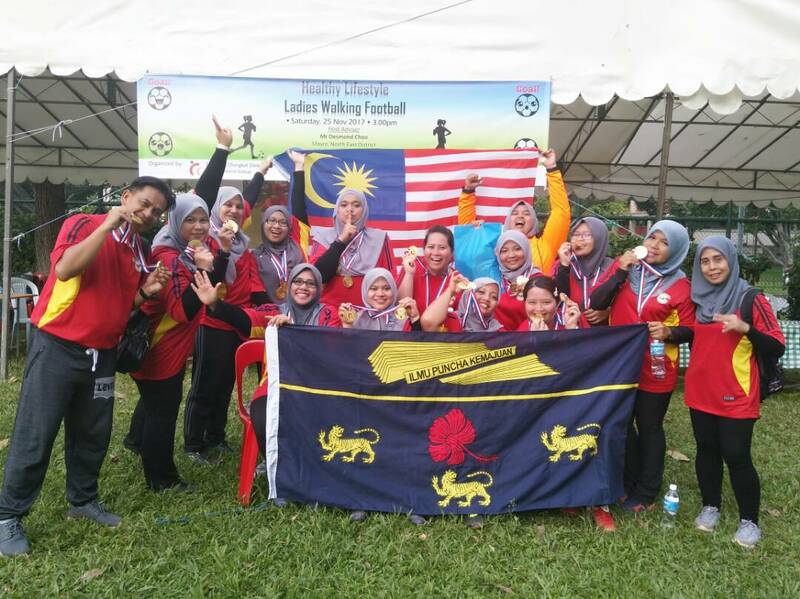 The morning research league was won by Lion Angels Extreme. 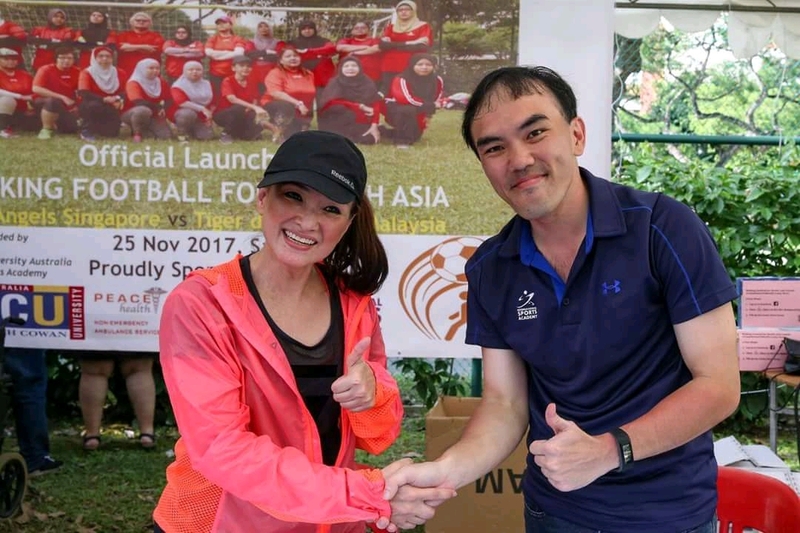 The afternoon Exhibition Match between Lion Angels and Tiger D'Warriors ended with the much fitter Tiger d'Warriors winning the match at 4-0. 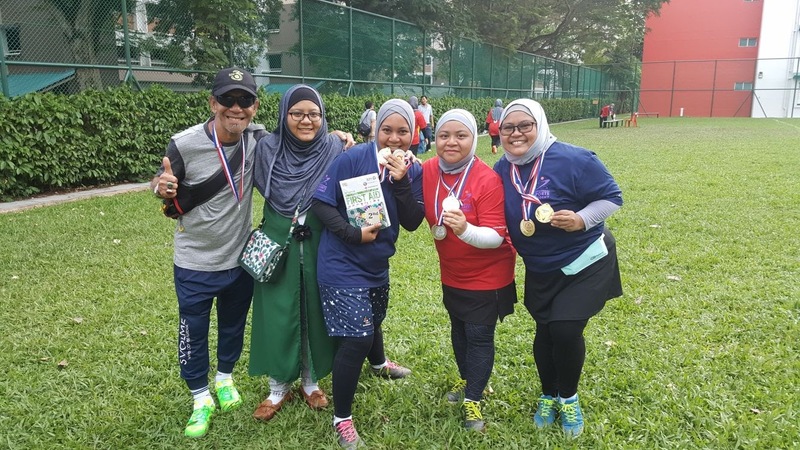 Talented individuals were celebrated with individual awards for their exemplary performance during the morning league matches. 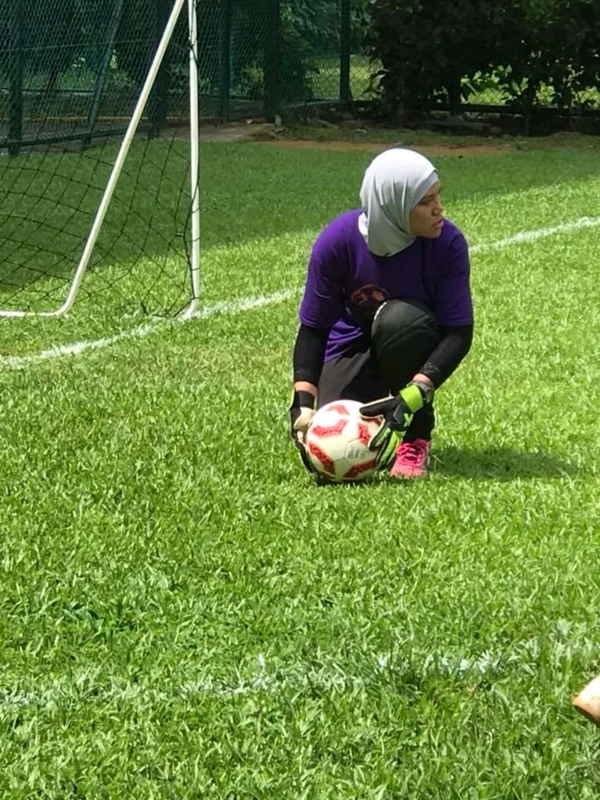 Awarded to the player who is an asset to the team, one who contributes in terms of leadership, motivation, discipline and portrays a steely character. 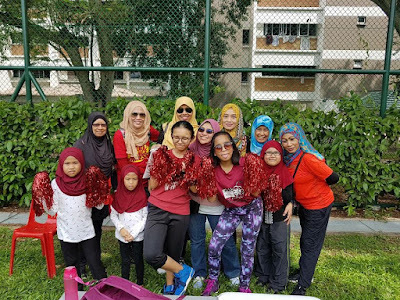 She rallies the team together positively. The team functions less without her. She contributes on and off the pitch and is someone the team looks up to. 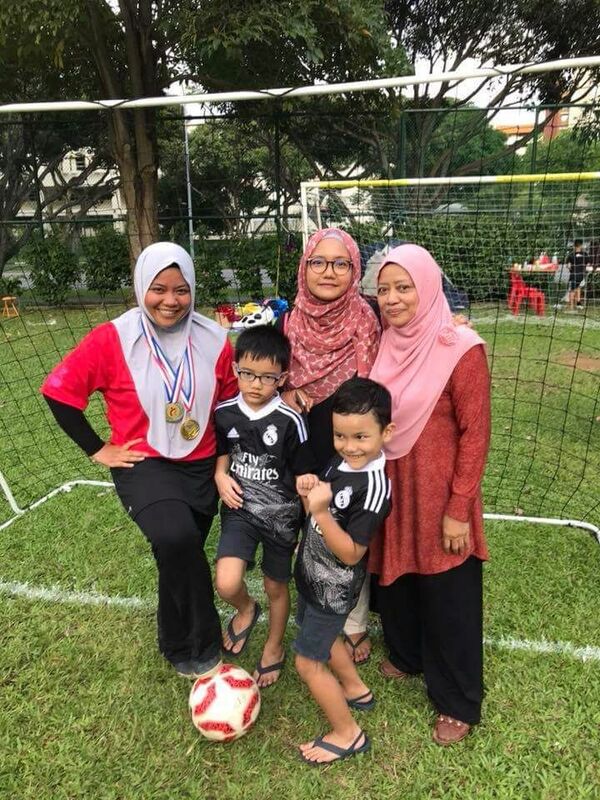 Awarded to the player who faces adversity and obstacles like health, family issues (among others) but yet managed to come up on top on and off the pitch. 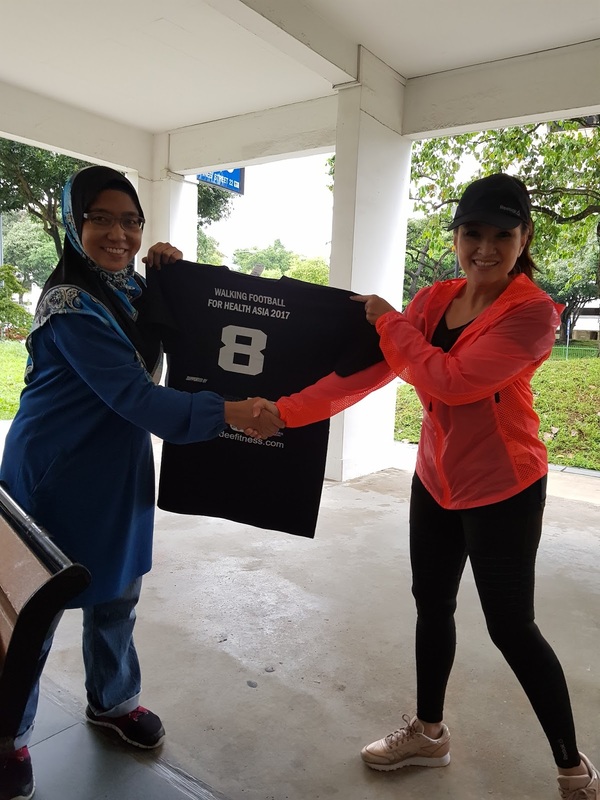 These challenges proves no barrier to her character and commitment. She also inspires others with her strong display of character. Awarded to the player who consistently display sporstwomanship. 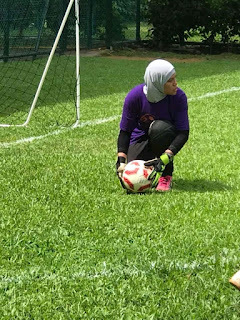 She is calm, cool, collected and displays compassion to not only teammates but also opponents, officials and others around her. 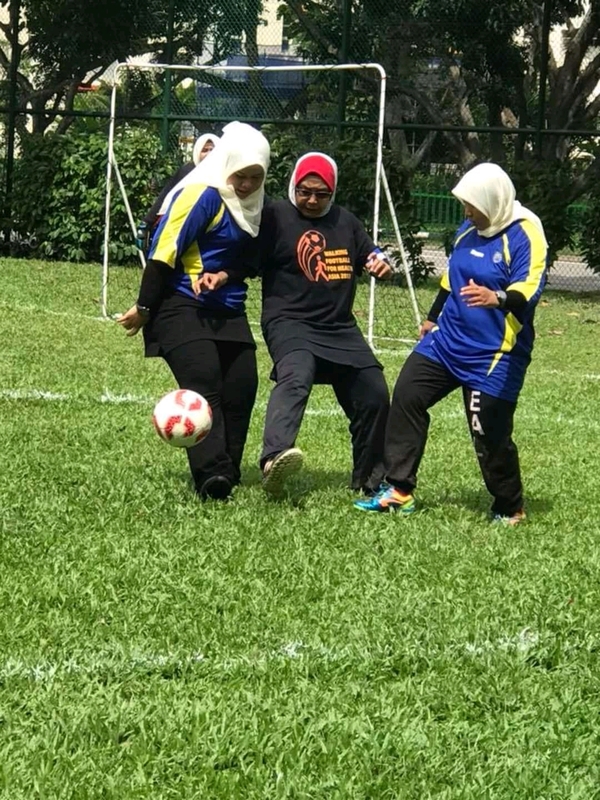 She shows the true spirit of sports and athleticism. Well, looks like Lion Angels Dynamite is the Best Safe Play team! 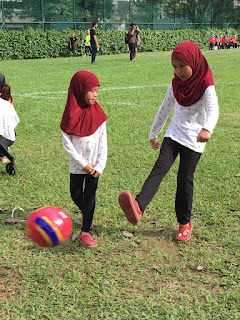 In the late afternoon before the Exhibition Match between Lion Angels and Tiger D'Warriors, there was a curtain raiser by Girls Dream Team, a youth women soccer team. 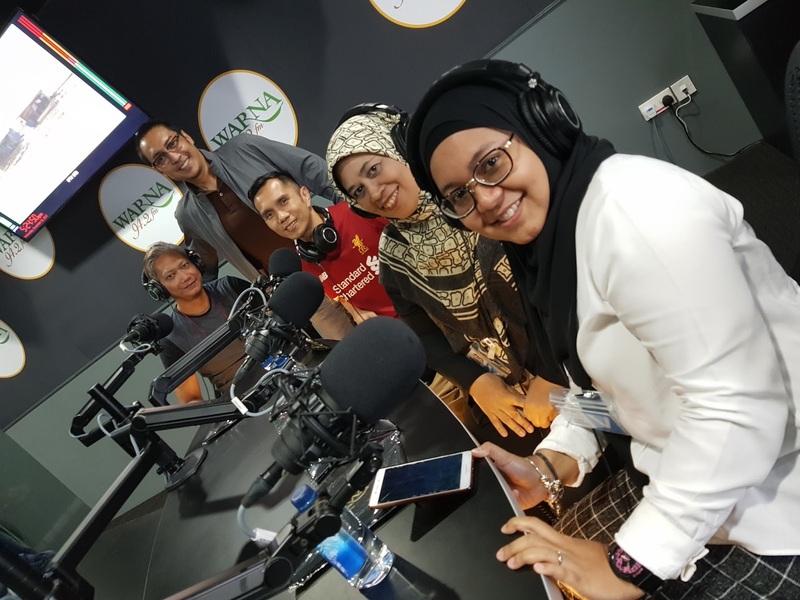 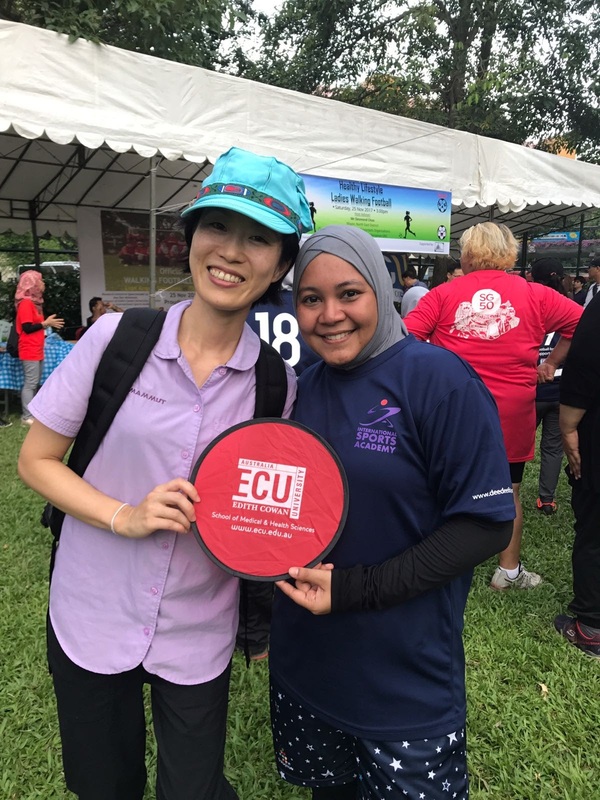 The message of empowerment of health through education and knowledge was emphasised with the presence of Edith Cowan University Australia and International Sports Academy Dr Fady, Jing, Adam , Shanghari respectively who were kept busy with enquiries on their Sports Science Diploma/Degree/Masters courses. 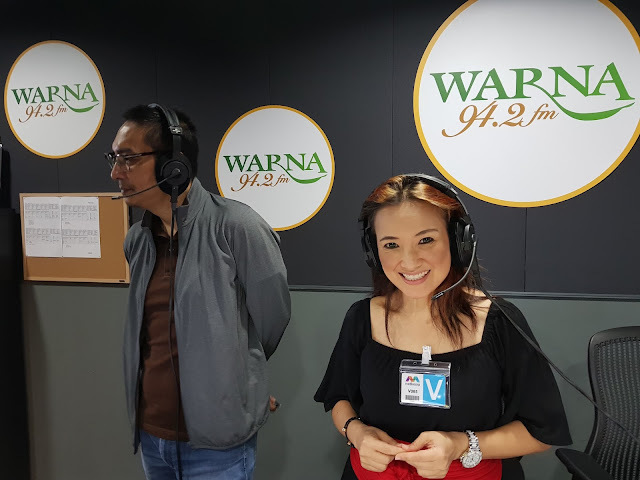 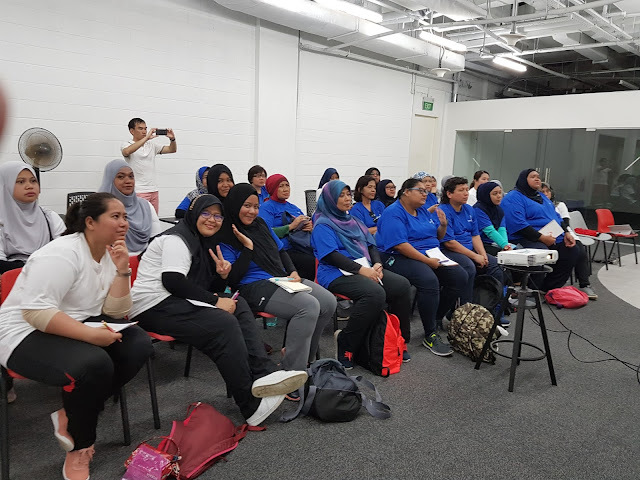 Dee Dee, herself an alumni and Adjunct Senior Lecturer at Edith Cowan University Australia and Lecturer for International Sports Academy was promoting her exciting and inspiring journey in education for the empowerment of health and fitness. 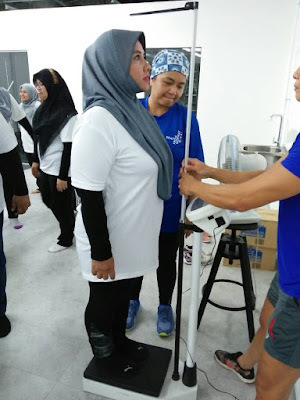 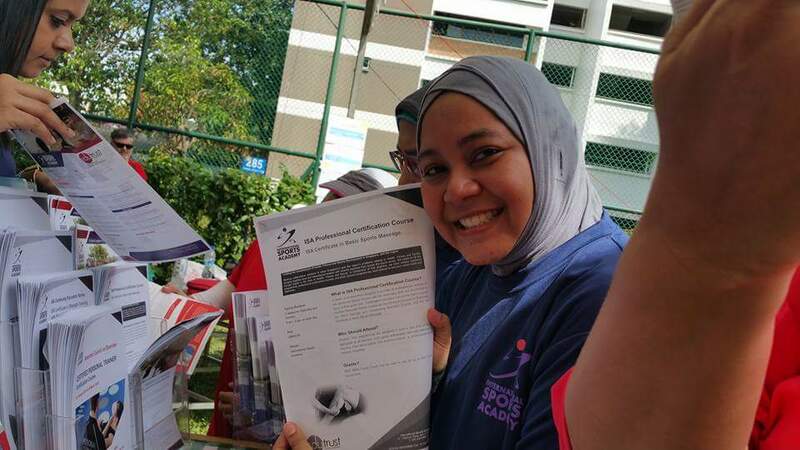 A Memorandum of Understanding was signed between Dee Dee Mahmood and International Sports Academy for the promotion and growth of personal fitness and sports science industry in Singapore. 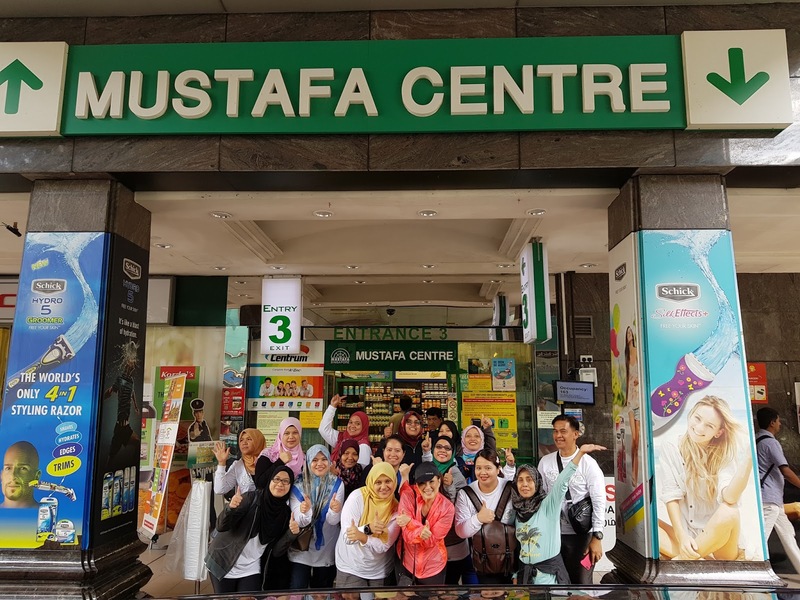 MHI Training Master, a P.A. certified provider, demonstrated CPR and AED First Aid. 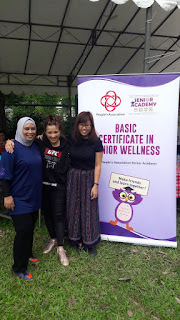 I have always promoted the importance and need to be a certified First Aider including all housewives. 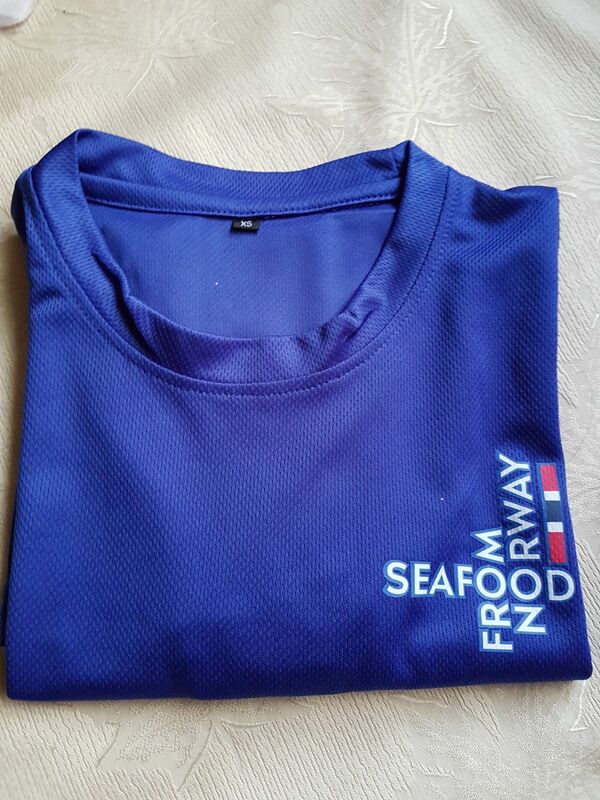 You might not know whose life you will save. Peacehealth Ambulance was extremely efficient in handling match injuries and they had a Standby ambulance all ready to be mobilised in case there is a need to. 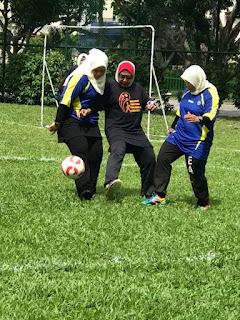 However as the award Best Safe Play denoted - it was safe and fair play for all teams and the standby ambulance was not used. 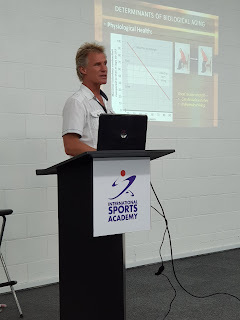 Nutrition in exercise recovery was supported by Fitharmonik Online. As a Nutritionist and Exercise Physiologist, I am always educating that protein is important for muscles repair and growth and it is particularly important after sports, including walking football. All attendees and players had free samplings of the Pumpkin Spice Protein Recovery (Nutrabio Classic Whey Pumpkin Pie) was the main draw at the booth. 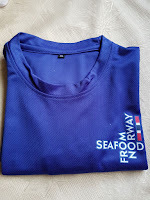 Another important protein food for recovery, rich with omega-3 fatty acids for heart health and brain and nerve development is the Norwegian salmon and trout. 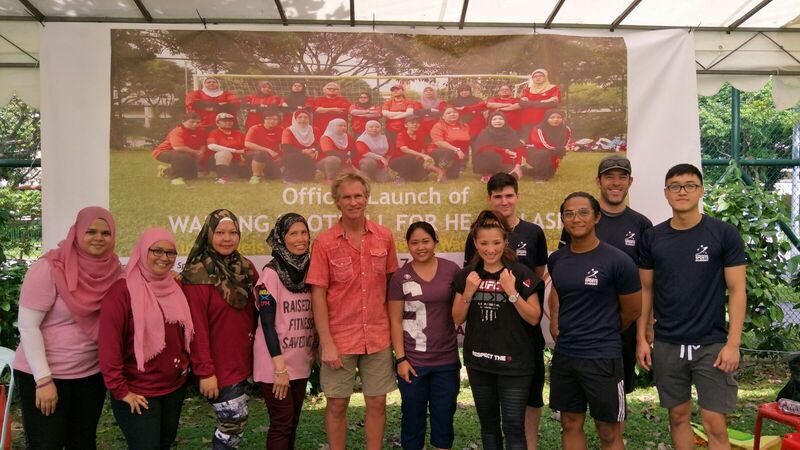 Norwegian Seafood Council is a proud supporter of Walking Football for Health Asia. 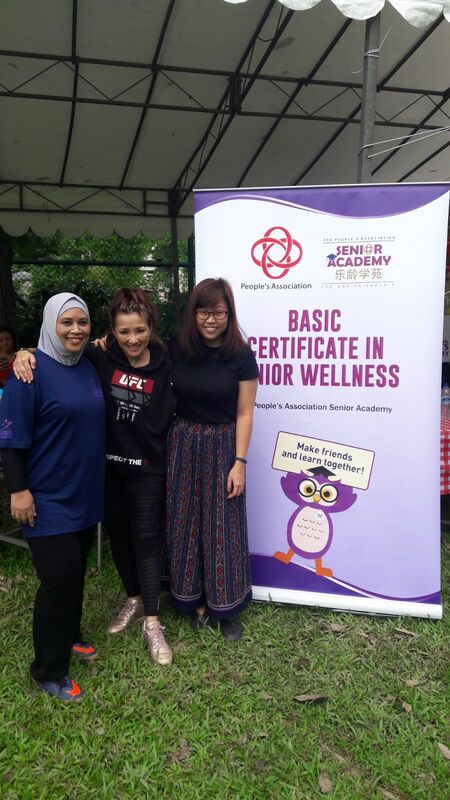 People's Association reached out to the community during the event, to promote Senior Wellness Courses using Skills Development Funds commencing in January to April 2018. 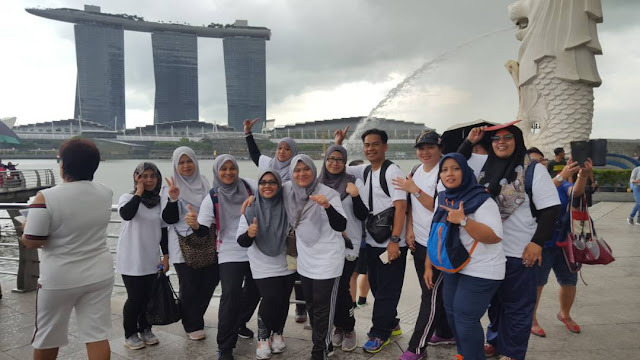 It is important to stay active and manage your health for optimal quality of life. 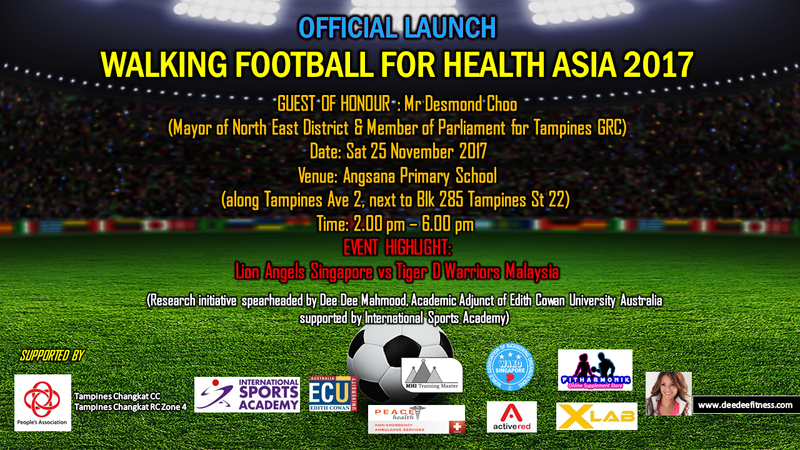 And the empowerment of health crossing borders with Walking Football for Health Asia. 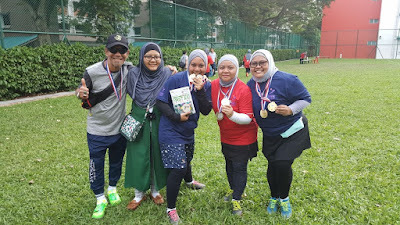 There were many winners on Launch Day: Lion Angels Extreme Singapore won the round robin research league in the morning, Tiger D'Warriors Malaysia won the afternoon exhibition match and Lion Angels Dynamite won the Best Safe Play Team. 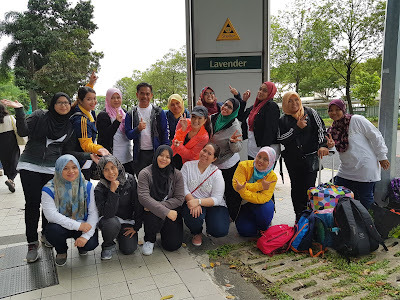 #EdithCowanUniversity, #InternationalSportsAcademy, #TampinesChangkatRCZone4, #MHITrainingMaster, #PeacehealthAmbulance, #FitharmonicOnline, #NorwegianSeafoodCouncil, #MakAiNasiPadang, #PeoplesAssociation, #WAKO, #ActiveRed and #XLab. 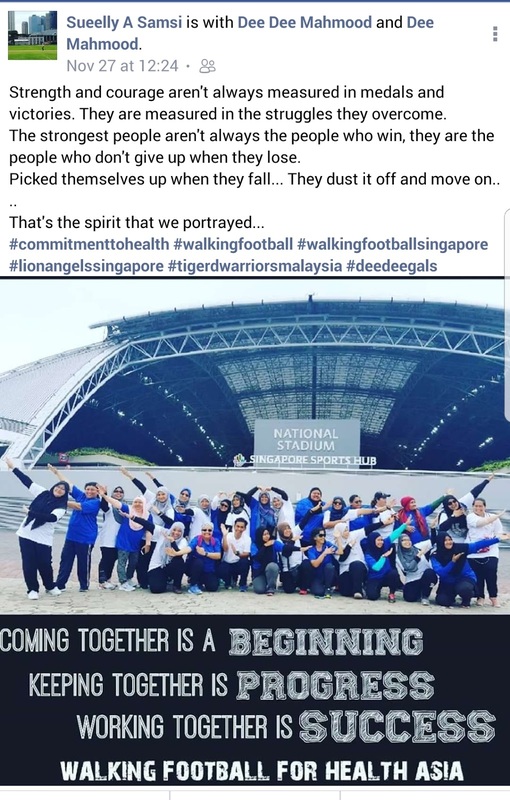 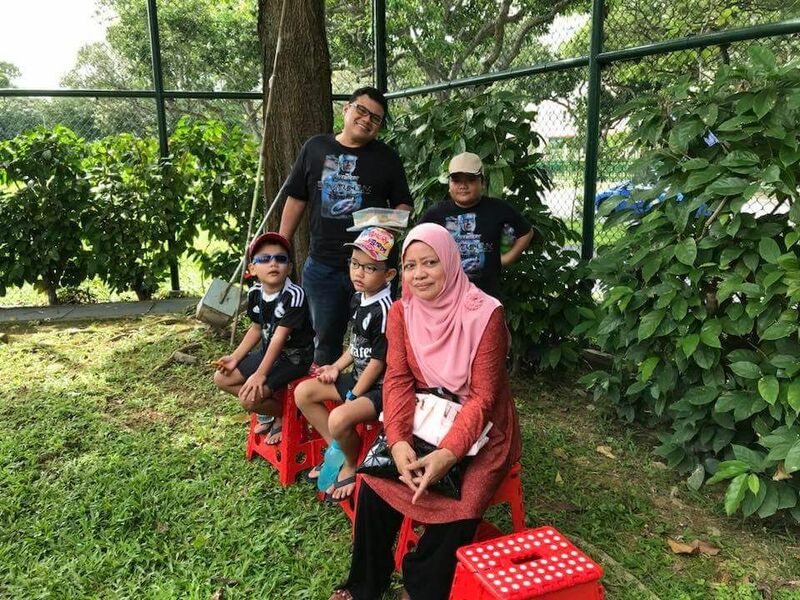 Appreciation to Coaches Masazhari and Masykur and Goalkeeper Coach Ayah Hamdi and Coaches' Assistants - Ben, Herman and Tahar Ahmad for Lion Angels Singapore and Ahmad Shahrudin, Siti Hawa, Siti Hajah for Tiger D'Warriors Malaysia. 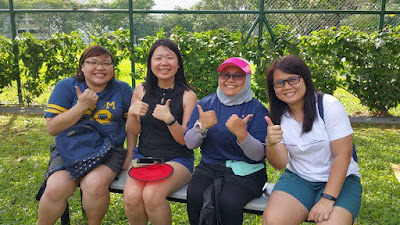 They worked hard in putting together individuals who worked together as a team. And putting people together is a big achievement considering the players' different levels of health and fitness and that their age spans from 20s to 60s. Thank you to Mr Abdullah of Tampines Changkat RC Zone 4 and our Guest of Honour, Minister of Parliament, Tampines GRC and Mayor of North East District, Mr Desmond Choo. 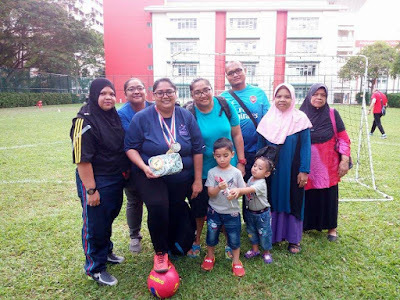 Community enrichment and health empowerment through modified sport - walking football - to combat sedentarism and improve health and quality of life. 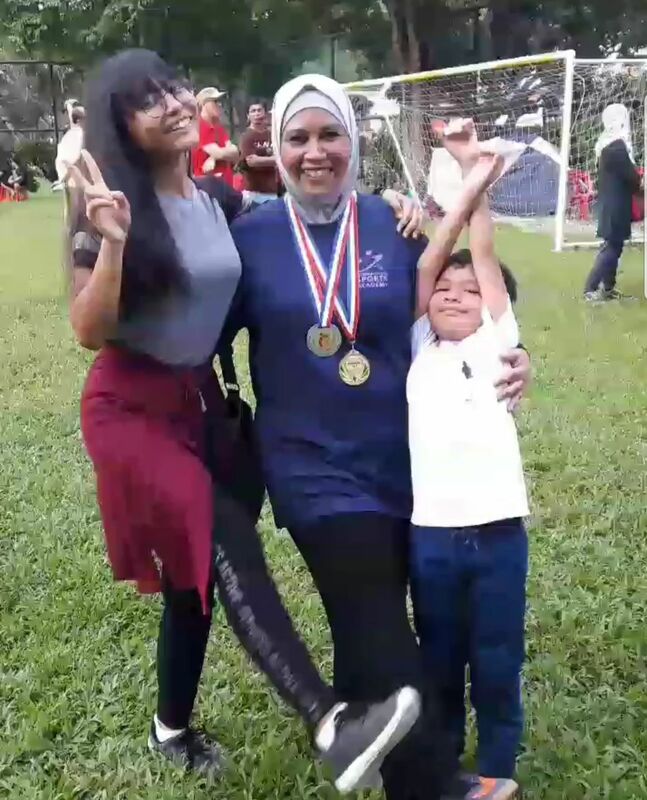 A definite win. 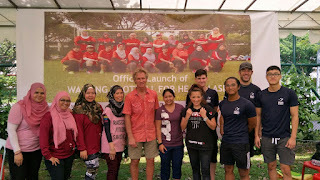 And you start them young..
#CommitmentToHealth Walking Football for Health Asia research initiative by Dee Dee Mahmood (Celebrity multi-award winning Exercise Physiologist, Nutritionist and Adjunct Senior Lecturer (International Collaborations) & Professor Dr Rob Newton, Dr Fady and Dr Favil of Edith Cowan University, in collaborations with Professor Dr Dan Heil of Montana State University - American College of Sports Medicine North-West, along with International Sports Academy and all our Partners in Health in Singapore and Malaysia has made its grand entrance. Empowerment through education continues the next day 26 Nov 2017 with a Talk entitled "The Health Benefits of Exercise for Aging Adults" by Prof Dan Heil. 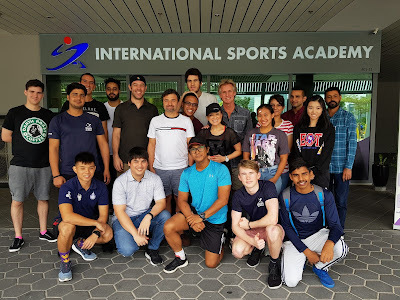 And the players attended "Basic Exercise Course" at International Sports Academy.